1.) 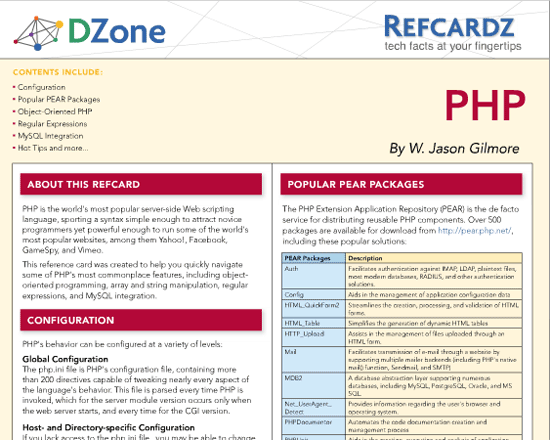 DZone has created professional Cheat Sheets for a number of PHP, and web development topics. These can save a ton of time from digging into a manual or doing a search online. These aren’t by any means the only cheat sheets out there, but you will find PHP, MySQL, XML, ASP, Java, Design Patterns, Joomla, and about 50 more easy to read, well designed cheat sheets. 2.) NetBeans is an IDE that stands out above all others. It’s completely free. It offers a built-in FTP client (Far superior to Dreamweaver) or supports subversion publishing. It is very small, fast, and has many built-in features that help create better code, more efficiently. Netbeans is hands down the best IDE, with the fewest bugs (Not completely bug free), and virtually no learning curve (Try that Eclipse…), that I’ve used. If you are holding on to Dreamweaver because of the FTP, or some other function that Eclipse PDE or Zend Studio is lacking, I urge you to take a look at Netbeans. When I’m not using SVN, I can save the file I’m working on and it is automatically uploaded to the web or testing server. Try it, you won’t be disappointed. 3.) 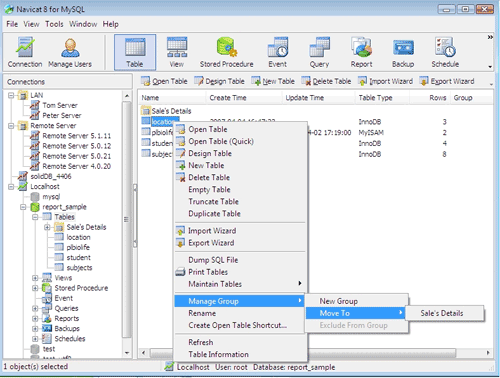 Navicat is by far the best database GUI, and my experience the best tool for database management on the market. Premiumsoft offers MySQL, PostgreSQL, Oracle versions, and now a single package that includes all three. Navicat provides an intelligent and efficient way to create, backup, and manage complex MySQL databases. It allows multiple methods of connecting, including a SSH tunnel, which protects your database from being accessed publicly. Apart from a good IDE, this is the #1 tool in my development toolbox. Navicat also offers a custom report building application, which can export data into Excel, Access, Text, XML, Lotus 123, or through an ODBC connection. This software is not free but they do offer a free 30 day trial. If you do a lot of database management, this software will probably pay for itself in time the first week you use it. 4.) 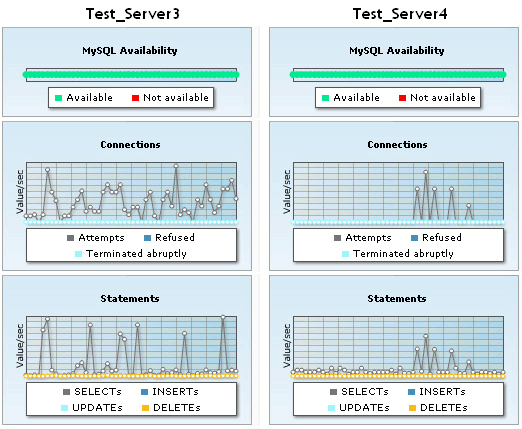 Monyog is a fantastic real-time MySQL reporting program. It offers visual graphs of a database’s performance, and stats on just about everything that can be measured in MySQL. It is an excellent way to monitor a Database and is indispensable for benchmarking and optimizing MySQL performance. 5.) MySQL Workbench is a free MySQL development program which can create visual diagrams of a database’s structure, among many other features. This can be very important when you are working with large or just new databases. A picture can be worth much more than a thousand words when you are diving into a complex database. Here’s a diagram of a moderately complex database, which could take a lot of time to understand without anything but the table structure. 6.) SQL Code Formatter is a quick tool that formats SQL code into an easy to read format. This tool can be indispensable when you are debugging other developers code, or trying to break-down a massive jumbled SQL statement. 7.) HTML Validator is a Firefox Plugin that provides an instant status of a page’s w3c validation as you browse. It also replaces Firefox’s built-in source view, with an intuitive and significantly improved interface. This is one of the best tools out for quickly finding problems with a site’s (x)html structure. 8.) Firebug is an outstanding debugging program that provides a ton of information about structure, scripts, and problems. 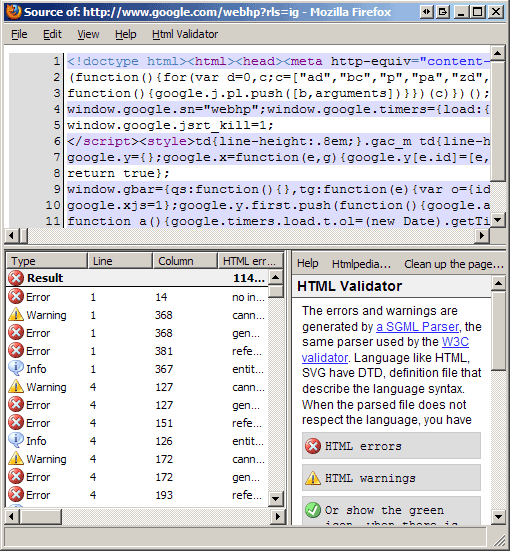 Firebug is an amazing tool, but can be quite complex, which is why I also use the HTML Validator plugin. 9.) Git is a very fast version control system, that supports quick branching, merging, and development capabilities. There are a number of public GIT hosting sites such as github that allow developers to publish and collaborate on their projects. Git gives each developer a local copy of the entire development history, and changes are copied from one such repository to another. These changes are imported as additional development branches, and can be merged in the same way as a locally developed branch. 10.) Subversion or SVN is another version control system, ironically despised by the creator of GIT, but is very commonly used and should be in any programmers repertoire. It is currently one of the most popular version control methods, and works with just about any platform. Quick comparison of GIT vs. SVN. 11.) 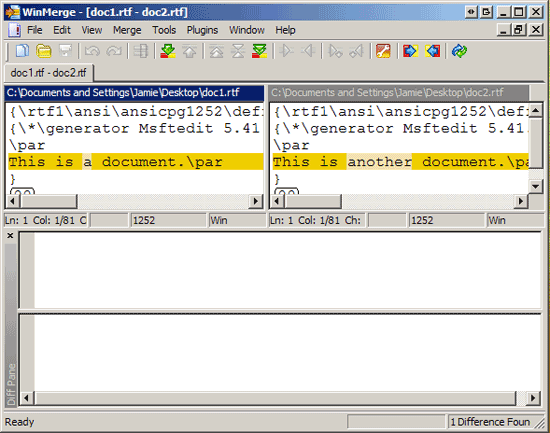 WinMerge is a fast file comparison program for Windows. It allows the user to quickly compare 2 files, and merge or edit as needed. This is by no means a version control method, but can quickly help determine differences between 2 documents. 12.) ColorZilla is a very fast color picker plugin for Firefox. When you need to get a color from a website, ColorZilla is probably the quickest way to do it. Not only will it show the HEX color code, but it shows the RGB values, and exactly what element is using the color. If you ever take on an existing website for further development it can be invaluable in breaking down somebody’s poorly designed css stylesheets. 13.) 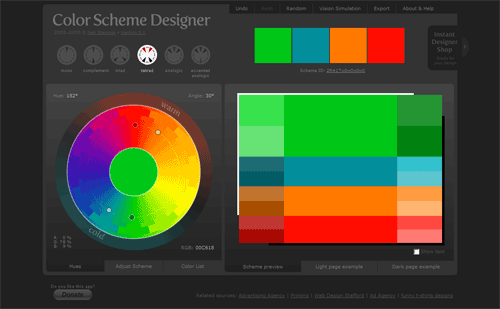 Color Scheme Designer is a no BS way to create compatible, attractive color schemes for websites, and user interfaces. There are dozens of color scheme generators out there, but this one does what is needed efficiently, for free, and without any extra fluff. Several pre-defined color patters are a click away, and you can see quick examples of a web page using the color schema that you’ve generated. 14.) 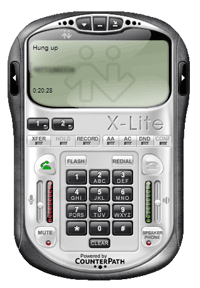 X-Lite is a free VOIP Softphone application. It offers all the features that a very advanced phone would have, including video. 15.) Trillian is a great way to combine all of your IM clients into a single, light-weight app. This program can free up a considerable amount of system resources compared to running multiple IM clients at the same time. It also lets you access all of your IM contacts through a single interface. 16.) ScreenGrab is a screen capturing program that’s slightly better than the “Prnt Scrn” button on your keyboard. It can either copy or save a capture to a PNG file. It allows capturing a complete page (including below the fold), only the visible portion of a screen, by selection, or the entire window. The only drawback is that it only works within Firefox. Any screen captures you see on this or my other blogs are done with ScreenGrab. 17.) Roboform is a username/password management program, and is the most important browser add-on that I use. 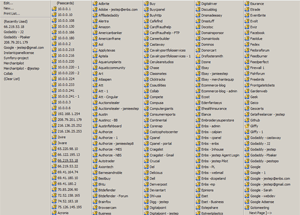 I currently have over 2,000 website profiles stored in it (One of many pages shown in the image), every one with a very secure and unique password like “fz96Dr%PpaZjaBfk“. It supports a variety of very advanced features and configurations to help keep your login credentials secure and easy to use. 18.) 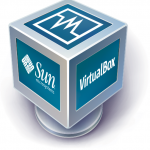 SUN Virtualbox is the best virtual computer deployment package that I’ve come across. It installs on a number of host operating systems, not just Linux, and supports just about every OS on the market for Virtual Appliances. It is extremely easy to install, is very efficient, and can be customized as required. Virtual hosts can easily be backed up, or cloned and distributed. If you’ve been afraid of exploring into Virtualization, I highly recommend looking at Virtualbox. There are so many benefits to this sort of technology, it’s something that every developer should be familiar with. 19.) Ultramon is a multi-monitor taskbar program. unfortunately Windows XP does not include for multiple taskbars if you multiple monitors. Ultramon fixes this in a fast, predictable manner, and includes many additional features such as desktop back ground stretching. Ultramon is not free but is far superior to the free multi-taskbar products that are available. 20.) 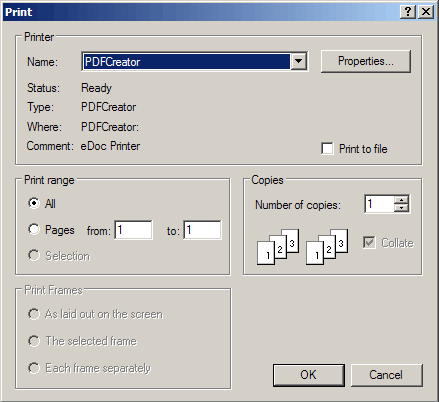 PDF Creator is a PDF printing application. It allows printing any file directly into a PDF. If you don’t need the ability to edit existing PDF documents, this is an excellent alternative to purchasing any other PDF software. Let me know if you’ve got your own set of essential tools that help in your development. That’s too bad that they’re having problems with it. Navicat is one of the only programs that I’ve used that has never been buggy for me, even a few versions back. I wonder if there is some platform or software incompatibility that’s causing it. I’ve heard about Netbeans as a great IDE for PHP. I am currently using NuSphere’s PHPED and would like to know what do you think of the two. If phpED’s price is not an issue, which one is superior? I agree with @Scott, Sequel Pro is one of the best desktop MySQL tools for Mac. What about YSlow, this firefox plugin I use all the time to test the some of the site performance. SQLYog – Great replacement for Navicat. Nice post, but I don’t see Firebug on here… a must have for web developers (Firefox). I don’t think it does “below the fold,” but it does everything else. I use this to augment text instructions when I’m trying to show a client how to do something. I updated the post to include numbers. Firebug was #8. You might want to check out Digsby for Instant messaging software. http://www.digsby.com It will even check your myspace/facebook/twitter/gmail/hotmail etc accounts for updates while suppport the major IM platforms. However, it doesn’t do IRC. Thanks for that great collection. I totally forgot one. Putty is absolutely essential for just about any serious web development, or server and network management. I use Bitvise Tunnelier in Windows. It’s a great terminal with SFTP and tunneling built in. I have used it but it doesn’t check correctly. I mean it showed some errors while W3C validator didn’t. The first impression about the your post: the first half “OK”, the second half “Windowsfag”. 😉 Windows is not a comfortable environment for developers. I finally switched to *nix platform a year ago and feel better. Im using netbeans now as my favorite IDE. I switched from Aptana. This is fantastic, a lot of these tools I will use straight away as they are so useful. I was already using netbeans, its really great! Eclipse PDT is a nice IDE for PHP. You should give it a try. I’m using it to deploy all my PHP applications.